In this lesson, we will walk you through filing your Articles of Organization with the California Secretary of State. This is the document that officially creates your California LLC. In 2018, the California Secretary of State issued some great news: California LLCs can be formed online. While you can still file by mail, we recommend the online filing (via BizFile) as it’s easier and the approval time is slightly faster. However, you’ll find instructions below for both the online filing as well as the mail-in filing. The filing fee for an LLC in California is $70. This is a one-time filing fee. The $70 LLC fee is the same for both online and mail-in filings. Note: California has sped up their processes. LLC approval time used to be 10-15 business days, however, that’s no longer the case. California LLC approval time is now 3-5 business days. That’s for both online and mail-in filings. However, it’s important to note that you’ll need to allow for a few extra business days for mail time. 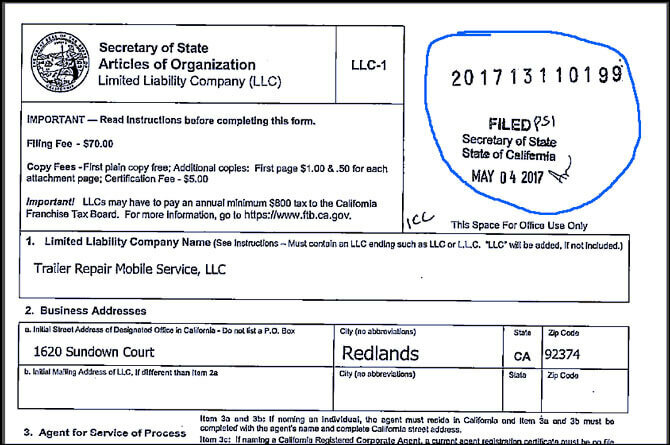 Once your California LLC is approved, the state will send you a stamped and approved copy of your Articles of Organization (along with a welcome letter). They will arrive by email if you file online or arrive by mail if you file by mail. As you may know, all LLCs in California must pay an $800 Franchise Tax each year, regardless of income or activity. If you’re forming your LLC late in the year (October – December), you may want to forward-date your filing to January 1st to avoid paying two (2) $800 payments back-to-back. For more information, please see how to avoid $1,600 in California LLC franchise tax. Are you a licensed professional in California? If you are a California licensed professional (architect, attorney, chiropractor, dentist, doctor, physical therapist, etc.) the state doesn’t allow you to form an LLC. For more information, please see most California licensed professionals can’t form LLCs. Prior lesson: Make sure you have read the California LLC name lesson before proceeding. You can’t change or edit anything in this LLC purpose statement section. It states that your California LLC can engage in any lawful activities. Enter your desired LLC name in this box, but leave out the identifier (ending). Select your preferred LLC identifier. Note: Your LLC name can’t include any of the following words: Inc., Incorporated, Corp., Corporation, bank, trust, trustee, insurer, insurance company, or any other words that suggest your LLC issues insurance policies. An LLC name reservation is not required to form an LLC and it’s often unnecessary. Most filers don’t check this box off. If you have a name reservation that’s already been filed though, check the box and enter your reservation number. Enter your LLC’s Designated Office address. You can begin typing the address in the first box (“address look-up tool”) and then select it in the list or you can manually enter your address in the boxes below. Select whether or not your LLC’s mailing address (where you can receive documents) is the same as its Designated Office address. Prior lesson: Make sure you have read the California Registered Agent lesson before proceeding. If you hired a Commercial Registered Agent, select “California Registered Corporate Agent (1505)”, search for the company in the list, then select them. If you, a friend, or a family member will be your LLC’s Registered Agent, select “Individual” and enter the name and contact information. Select whether your LLC will be Manager-managed (select “One Manager” or “More than One Manager”) or Member-managed (select “All LLC Member(s)”). A Member-managed LLC is where all the owners have the ability to bind the LLC in contracts and agreements, as well as run the business and day-to-day operations. A Manager-managed LLC is where one, or a few designated people (called “managers”), have the ability to bind the LLC in contracts and agreements, as well as run the business and day-to-day operations. The other members cannot bind the LLC in contracts and agreements, and they can’t take part in running the business and day-to-day operations. While the members initially vote-in the managers, after that, the members take a passive/investor role. Related article: what is an LLC Organizer? Enter the name and email address of the LLC Organizer. As mentioned earlier (how to avoid back-to-back $800 franchise tax), if you’re forming your LLC later in the year — October through December — and you don’t need your LLC open right away, you can forward date your filing to January 1st. Otherwise, your LLC effective date (the date your LLC goes into existence) will be the date the Secretary of State receives your filing. If you want your LLC to be marked effective on a future date (which can’t be more than 90 days ahead), select “Yes, I would like a Future File Date” and then select a date from the calendar. Review the information you entered and make changes if needed. If everything looks good, click “Next” to proceed to the payment section. Select whether you want a “Filing Only ($70)” or a “Filing + Certified Copy ($75)”. With the Filing Only ($70) you get what’s called a “plain copy” of your approved Articles of Organization. For $5 extra you can get a “certified copy”. The only difference is that a certified copy has a state stamp/seal on certifying the document. Most people don’t need the certified copy, however, if you’re not sure, go ahead and treat yourself; it’s just five more dollars. Then enter your billing and credit card info and submit your LLC filing to the state. Congratulations! Your California LLC filing has been submitted to the Secretary of State. Note: Your Submission ID Number isn’t the same thing as your LLC’s Entity Number. You’ll find your LLC’s Entity Number on your Articles of Organization (once it’s approved by the state). After the California Secretary of State receives your LLC filing, it will be approved in 3-5 business days. However, during peak filing season (December through January), it can take 6-8 business days. Once your California LLC is approved, you’ll receive an email from the state containing a copy of your stamped and approved Articles of Organization (along with a welcome letter). If you have any questions, you can contact the California Secretary of State at 916-657-5448. Their hours are Monday through Friday from 8am to 5pm, Pacific Time. The video below starts with an overview of California LLCs, then at 7 min. 45 sec. you can see the Articles of Organization being completed. Prepare a check or money order for $70 and make it payable to “Secretary of State”. Mail your signed Articles of Organization and payment to: Secretary of State, Business Entities, PO Box 944228, Sacramento, CA 94244-2280. Entity Information: Enter your LLC name. Leave ‘Entity Number’ and ‘Comments’ blank. Return Address: Enter the address where you’d like your LLC approval sent to. This can be any address you’d like; it doesn’t have to match the address in the Articles of Organization. The following information is provided for educational purposes only and in no way constitutes legal, tax, or financial advice. For legal, tax, or financial advice specific to your business needs, we encourage you to consult with a licensed attorney and/or CPA in your State. The following information is copyright protected. No part of this lesson may be redistributed, copied, modified or adapted without prior written consent of the author. A Limited Liability Company is a hybrid between a Corporation and a Partnership. An LLC protect your assets in the event of a lawsuit. In order to form your LLC, you must file LLC Formation Documents with the Secretary of State. Once your documents are approved and sent back to you, your LLC is now in existence and authorized to do business in the State. We have spent considerable time to make the details of this video simple and easy to understand. However, we cover a lot of ground and you are going to hear a lot of new terminology. We do recommend that after you watch this video, you watch it a second time in order to fully comprehend all the information provided. Please make sure you have watched the first Lesson on researching your LLC’s name. Your desired LLC name must be available for use before you proceed with filing your LLC Formation Documents. Your LLC is required to list a Registered Office and a Registered Agent within your LLC Formation Documents. The Registered Office is a physical address (it cannot be a PO Box) that is located in the State where your LLC is formed. A Registered Agent is a person or a company who agrees to accept legal mail and important documents on behalf of your LLC. The Registered Agent is located at the Registered Office and is generally accessible during normal business hours. As we mentioned, a Registered Agent can be a person or a company who has an address in the State where your LLC is formed. You, as an individual, can be your LLC’s Registered Agent. However, your LLC cannot be its own Registered Agent. For individuals who have an address in the State, it is most common that they serve as the LLC’s Registered Agent. Having said that, the individual person you choose as the Registered Agent does not need to be a member of the LLC. It can be a friend or a family member, or, frankly, anyone you know who agrees to accept Service of Process on behalf of your LLC. Service of Process is the delivery of legal mail and important documents sent from the State or a law firm to your LLC. Correspondence from the State can include items such as Annual Report notices, late notices, and copies of Formation Documents. Legal documents can include items such as subpoenas, and/or complaints for legal action. Again, the purpose of designating a Registered Agent is to authorize someone to accept Service of Process on behalf of your LLC. Whoever agrees to be your LLC’s Registered Agent must agree to do so. Some states require that they sign your LLC Formation Documents, but California does not require this. You will just need to list their name and address within your LLC Formation Documents. Takeaways. The purpose of a Registered Agent and its Registered Office is to be a point of contact for the State and to accept Service of Process for your LLC. You or someone you know can be your LLC’s Registered Agent, so long as you have an address in the State. Of you don’t have an address in the State that you can use, or don’t want to serve as your LLC’s Registered Agent, you can hire a Commercial Registered Agent. Using a Commercial Registered Agent will also help protect your privacy as the information listed in the LLC Formation Documents will become public record. A Commercial Registered Agent is a company that specializes in receiving Service of Process on behalf of businesses nationwide. They typically charge between $100 and $300 per year. If you decide to use a Commercial Registered Agent, we recommend Northwest Registered Agent, LLC. They have been in the business for more than two decades and have built up a solid reputation. Their fees are among the most affordable, and their support is top-notch. We’ve joined forces with them in order to provide Registered Agent services nationwide to your clients. There’s a link below this video where you can find instructions on how to sign up for their Registered Agent services. Now, let’s discuss your LLC Formation Documents. The name of the LLC formation document for the State of California is called the Articles of Organization. This document is not complicated and contains basic information, including listing your Registered Office and Registered Agent. We will walk you through the details of the Articles of Organization in just a couple minutes, and we will make sure you get it filled out correctly. Once your Articles of Organization are completed, you will need to submit them to the State along with the filing fee. You will find the filing fee amount, accepted forms of payment, and the address where to send your Articles of Organization to below this video. Your Articles of Organization do not need to have original signatures. You can file your original, or you can file a copy if you prefer. It is a good idea however, to keep a copy for your business records. Once you mail the filing fee, along with your Articles of Organization, the State will review and process your paperwork. If there are any issues with your Articles of Organization, the State will mail back a letter with instructions on what needs to be corrected. If there are no issues with your filing, the State will mail back a stamped approved copy of your Articles of Organization within approximately 10 – 15 business days. Once you receive your stamped and approved Articles of Organization, your LLC is now a legally formed business in the State of California. Please keep a copy of this document with your business records. Do not order your EIN (also known as your Federal Tax ID Number) or start to use your LLC for any business purposes until you have this approval. California has additional ongoing requirements (and fees) that must be submitted in order for your LLC to remain in compliance. Failure to file these items on time will result in the State charging late fees and they may dissolve (or shut down) your LLC. The first of these requirements is the initial Statement of Information. It is due within 90 days of approval of your LLC and the filing fee is $20. Your next requirement will be your Annual LLC Franchise Tax. Your Annual LLC Franchise Tax will be due every year and will be a minimum of $800. Then, every two years, you will have to file an updated Statement of Information. The cost will remain the same at $20. These additional filing requirements are discussed further in Lessons 5 and 6. Don’t worry, we will walk you through completing the paperwork for both. We are now ready to fill out the Articles of Organization. You can download this document below the video. Let’s get started. Here we are, inside the Articles of Organization. This is a 1-page PDF document. The form can be filled out on the computer or it can be printed, and then filled out by hand. If you fill it out by hand, please use blue or black ink. Make sure to print the document on white paper that is letter-sized (that’s your standard 8.5 by 11 inches). Also, please note that I have a professional version of Adobe Acrobat. You may just have a simple version of Adobe Reader, and you may not have as much functionality in order to edit and type inside the document. If that’s the case, simply print the document and then fill it out by hand. You’ll notice at the top of the Articles of Organization, they mentioned the filing fee. The next paragraph that says a separate non-refundable $15 service fee, this is only if you drop the application off in person so this is not applicable. There’s also a notice here regarding the minimum $800 Annual Franchise Tax fee. We have details and instructions and documentation on that for you in Lesson 6. Before we get started, one other thing to note at the bottom of this document, you will have a PO box and the address where to send these documents to. Make sure that you double-check and you cross-reference this address with the address that we have listed below this video. You may be watching this video in the future, and we want to make sure that you have the most up-to-date address and you’re not just looking at the address that you see on the video right now. And one last thing, if you’re filling out this document on the computer, they did kind of mess it up a little bit, so down underneath Service of Process, they have like this extra line, and then down here there’s an extra line, but those don’t need to be filled out. All right. let’s get started. To save time, I’ve already filled this document out, so let’s go through each section together. Under Section 1, I’m going to list the name of my LLC. For this example, I’ve used “ABC Widgets, LLC”. Make sure that you include the letters “LLC” or “L.L.C.” at the end of your name. And in this example, I’ve used a comma, but the comma is not required so it’s a personal preference. You can use one if you’d like, or you can leave it out. Section 2, you don’t need to do anything there. It just says that the LLC is authorized to do any and all lawful activities within the State. Next in Section 3, you’re going to list the address of the LLC. This cannot be a PO Box, so this could be your home address, or could be a business address. Next in Section 4, we’re going to include the name of the Registered Agent and the Registered Office. For this example, let’s say that I’m John Doe. I’m going to be the Registered Agent for this LLC, or for my LLC. So, I’m going to put my name here, and again I’m going to put my address once again. Let’s take a look at another document if we were to use a Commercial Registered Agent. I have one filled out over here. Let’s scroll down. Let’s say for this example I’ve used Northwest Registered Agent. One thing to make note of if you’re using a Commercial Registered Agent which is already registered with the State of California (which most likely they are), you don’t even have to include their address. You simply just list their name under Section A. So in this case I’ve just listed “Northwest Registered Agent, Inc.” and they include their Registration Number there. So pretty much the documents are very similar: if you have a Commercial Registered Agent you’re just going to list the company name on A. You don’t even need to list the name on B. For this example, this is myself acting as a Registered Agent for the LLC. If it was a family member at a different address, I would simply just put their name there and enlist their address in B. Under Section 5 for Management, you’re going to check off that the LLC will be managed by all Limited Liability Company (Members), and that’s it. It’s a pretty simple document. Down below, you’re just going to print your name, and then once you print this document out, you’ll simply sign above the line here that says “Organizer”. One question that customers do ask is whether or not this document needs to be notarized. It does not. You’ll simply just print it out, sign it, send this in with your filing fee, and in about 10-15 business days you’ll get back this document with your stamp of approval. Pretty simple, let’s just do a quick one-through once again. At the top, Section 1, you’re going to list the name of the LLC. Section 2, there’s nothing to be done there. Next in Section 3, you’re going to list the address of the LLC. Now this doesn’t have to be an official business address or anything of that sort, it can be a home address or it can be a business address if you do have one. Under Section 4, you’re going to list the name and the address of the Registered Agent if it’s an individual person. If it’s a Commercial Registered Agent that is registered with the State, over in this example we’re just going to list their name on line A and we’ll leave line B blank. so for this one, I’ve used myself as the Registered Agent and I’ve included my address. If you’re using a friend or family member, you just switch and put their name on A and their address on B. Section 5 for Management, you check off “All Limited Liability Company (Members)” will be managing the business, and you’re going to print your name here, print this document out, and sign on this line. Again, once you submit everything to the State, you’re going to get back a copy of your Articles of Organization with a stamp of approval, and that will arrive in approximately 10-15 business days. And that concludes this Lesson. Allow a few extra days to account for mail time, so maybe about 1 to 2 weeks total. Once your California LLC is approved, the Secretary of State will send you an approved copy of your Articles of Organization in the mail (along with a welcome letter). They will be mailed to the address you listed in your Mail Submission Cover Sheet. Thank you for such an informative guide on forming LLCs. The videos are extra-helpful. 1) I don’t want to use my home address because I don’t want it to be publicly available. Would it be visible to the public if I list my home address in this field? 2) Can I put my address provided by my Registered Agent in this field instead, even though it’s not where the “business records are kept”? Hi Arthur, you’re very welcome! Thank you for the nice comment. Minus the Mail Submission Cover Sheet, everything else is public record. You can list the address of your Registered Agent for #2 (Business Address) if they allow it. Some do, but most don’t… and some will even charge fees if they start getting a lot of your mail. In the case of privacy, I recommend using Northwest Registered Agent as they’ll let you use their address across your entire filing for privacy. Hope that helps! 6. “The person signing LLC-1(i.e the organizer(s)) need not be a member or manager of the LLC”. But on the video, you have mentioned that LLC owner “John Doe” is filling form up him self, and he can be a Service Of Process individual. Can “John Doe” sign it as organizer? Or who can sign it if not him? Hi Sergii, you’re welcome. Apologies for the confusion. You can certainly sign as the LLC Organizer. The LLC Organizer is the person (or company) completing the Articles of Organization and submitting it to the state. We’ve expanded upon this further here: LLC Organizer vs Member. Love all the great info, but one small question. When we send the check for $70 to “California Secretary of State” do we make it payable to “Secretary of State” or “California Secretary of State”? What is the process for forming a holding company and a Operating company? Hi Eric, the holding company (also called the parent LLC) should be formed first (which will be owned by you). Then form the 2nd company (the child LLC). If the Articles of Organization asks for LLC Members, list “Parent LLC”. If LLC Members are not asked for in the Articles of Organization (which they are not in the California Articles of Organization), then you can organize the LLC yourself (or have someone else organize it). That person is known as the LLC Organizer. Have the LLC Organizer sign a Statement of LLC Organizer stepping down as Organizer and listing the LLC Member as “Parent LLC”. Then create an Operating Agreement where “Parent LLC” is the Member of “Child LLC”. Make sure for the signature section (of the Operating Agreement and all documents) to enter the name of “Parent LLC”. Then one line below enter “Your Name, Member”, “Your Name, Manager”, or “Your Name,” followed by any applicable title. This way, you are signing on behalf of “Parent LLC”. Hope that helps! Thanks alot…One more since the child company will be the one operating doing business.Will this make it the companies to separate entities? Hey Eric, if the LLCs are set up correctly, then yes, they are separate entities. Hope that helps. Would I need two separate ein numbers? Hi Eric, please check with an accountant on this as there’s a few ways to do it. Thanks. Hey Matheus, if you check the Current Processing Dates on the Secretary of State’s website, you can see they are processing LLC formations received on March 30th. You’ll need to account for processing time (10 – 15 business days) and some days for mail time. So while you could call and check the status, if you just remain patient, you’ll likely get your approval docs in the mail within a couple weeks. Hope that helps. Hi Eric, I know you were setting up a Parent LLC and a Child LLC. In what states were those setup? Did you create 2 LLCs? I’m in california, actually do i need to file two separate LLC1 forms when doing it the way you explained? Hi Eric, to make sure we’re still on the same page, did you form 2 LLCs, both located in California? One LLC is owned by you (the Parent) and one LLC is owned by the Parent LLC (the Child), correct? If so, both LLC’s have reporting requirements. That means both have to file their own Statements of Information, Annual Franchise Tax, Form 568, etc. Hope that helps clarify. Hi Matt, boy your website make this so easy! Written very clear that a 3rd grader could understand. Thank you for taking the time to offer this information and help us all out. My questions is this. After the I fill everything out and send it into the state, how are all the members officially recorded and recognized as members. In my situation it will be myself and my partner as members. How does that officially work? I see there is nothing addressing this in the actually form submission. Hi Alan, thanks for the awesome comment! Happy to hear we’ve been able to make things easy for you. And great question. California doesn’t require Member information on the Articles of Organization. You can document that via the LLC Operating Agreement and you can also have the person who signed the Articles of Organization (the LLC Organizer) sign a Statement of LLC Organizer, appointing the LLC Members. So the Statement of Organizer + the Operating Agreement will do it. Hope that helps! Hi Eric, in that case, your California LLC was approved. You can proceed with the EIN application (before the stamped and approved Articles of Organization arrives in the mail). Hope that helps. Hi Matt. I am so happy I discovered this site! Thank you for making it so clear. The one question I have is about the California LLC addresses in the form. We just bought a rental property and want to form an LLC for protection. I expect all the legal mail related to LLC’s will come to me at my place of residence. I’m confused as to where, or if, I need to enter the rental property address. The form I downloaded from your link is now slightly different than the one in the video. Hey Mark, you’re very welcome! Thanks for the nice comment. In order to have your rental property protected by your LLC, the LLC needs to own the rental property (not have its address in your Articles of Organization). Hope that helps. I am wanting to become an Amazon FBA, and was thinking of doing an LLC-S to ensure that any taxes I might owe are seperated from my personal taxes. I am wondering the timing of forming an LLC-S. Can I start my FBA and in a few months, if I am successful, form my LLC? If so, can I capture my start up and profit under the LLC even though the items/profits were purchased/earned prior to the LLC being formed? Hi Marie, I think you are confusing the LLC’s personal liability protection (keeping personal assets separate from business assets) with how the LLC is taxed. Unless your LLC is earning a certain amount of net income, keeping the LLC taxed in its default status (LLC taxed as Sole Proprietorship) is often better since you’ll pay less in taxes. You can find more information on S-Corp taxation here: S-Corp taxation for LLC. You can start the FBA as a Sole Proprietorship and file a partial year’s return and then later form the LLC (and you’d file a different Schedule C), but no, you shouldn’t move income/expenses to an LLC when it doesn’t exist. Hope that helps. Planning to form a LLC in January. I have several business ventures that all relate to Real Estate. What are your suggestions regards to having each venture separate? Hi Tamica, it’s challenging to offer a black and white answer as it depends on how much your personal net worth is, the potential liability of each venture, and more details. It’s a question much better suited for an attorney. Hope that helps. Thanks for your understanding. I am a licensed architect that provides construction management services as well. I want to form an LLC in California. Are these services considered a professional service and thus may not be a LLC? I registered these services with the Sec. of State in 2016 as an LLC and it was registered. I dissolved this a year later. Any idea why the LLC was approved then, but not now? Hi Patrick, the Secretary of State hasn’t always checked on this, which is why it went through. But that doesn’t mean you’re going against the the law. Architects are most often considered to be rendering professional services. Instead of an LLC, you’ll want to consider a Professional Corporation. We recommend have a conversation with an attorney. Hope that helps. Thank you for all your help! My husband and I are starting a sports league for adults and using an LLC. I am a nurse and understand that I can’t be the registered agent, but can we do a member managed LLC and I be one of the owners as well. It is just him and I.
Hi Sarah, what makes you think you cannot be the LLC’s Registered Agent… are you referring to the restrictions for licensed professionals and California LLCs? If so, that restriction only applies if the LLC you are trying to form is going to offer the professional services for which you are licensed. A sports league doesn’t fall into that category. So you can be an LLC Member and you can also be the LLC’s Registered Agent if you’d like. Hope that helps. Hi Barbara, yes, you can register your Louisiana property under your California LLC. Before you can do that however, you’ll need to register your California LLC as a foreign LLC in Louisiana. Foreign registration allows an out-of-state LLC (which in this case is your CA LLC) to do business in another state (Louisiana). Having said that, it’s also a good idea to speak to a few real estate attorneys. In this example mentioned, it’s just one CA LLC (registered to do business in Louisiana)… you may want to examine 1 LLC vs multiple LLCs… in addition, examine foreign LLC registration vs. a Louisiana LLC (or LLCs) owned by your CA LLC. There are a number of ways to structure this. Unfortunately, there isn’t one ideal setup that works across the board. Additionally, once you have your LLC (or LLCs) set up, you’ll need to transfer title of the properties from yourself to your LLC(s). Just forming an LLC, but holding property in your personal name does nothing. Hope that helps.